Hunter Ebonite Intermediate Oboe Description: Oboe Specs: Key of C Ebonite Oboe Body w Woodgrain Finish, Silver Plated Keys, Modified Conservatory System, Low B Key, Left Hand F Key and F Resonance Keys. Accessories: French Style Hardshell Oboe Case w Canvas Carry Cover, Handmade Reed, Oboe Maintenance Kit The MRC Ebonite Intermediate Oboe Rental package is a great choice for any advancing oboe student. 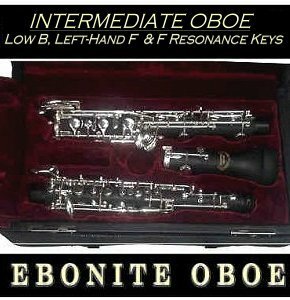 The MRC Oboe with Low B Key is a well made and rugged key of C Oboe and produces an excellent level tone with its ebonite body. Looks great too! Its also has the sought after Low B and Lefthand F Keys. Insurance and repair coverage is included. Select from 3, 6 or 9 month rental options. Rental goes to monthly billing at the end of the up front rental period you select and you may return at anytime. There is a purchase option included with every Oboe Rental. We can ship your oboe rental anywhere in the USA! Order Online Now. Click Here to Play an Oboe Sound Sample.